Perth is home to some truly spectacular coastline, which begs for the question: which are the best beaches in Western Australia? No need to do your own research, we’ve done it for you. 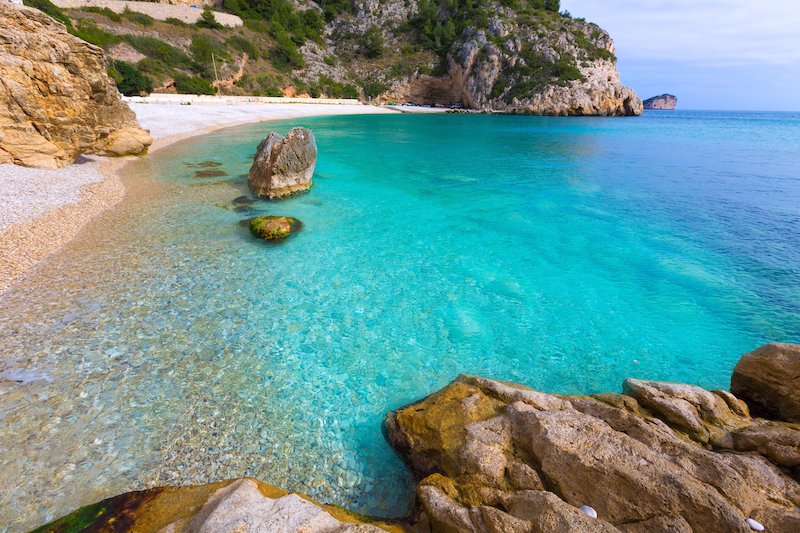 Here’s a compiled list of the best beach spots in Western Australia, whether you are a snorkelling enthusiast or a fan of sunset beach walks, there is a perfect beach for you. 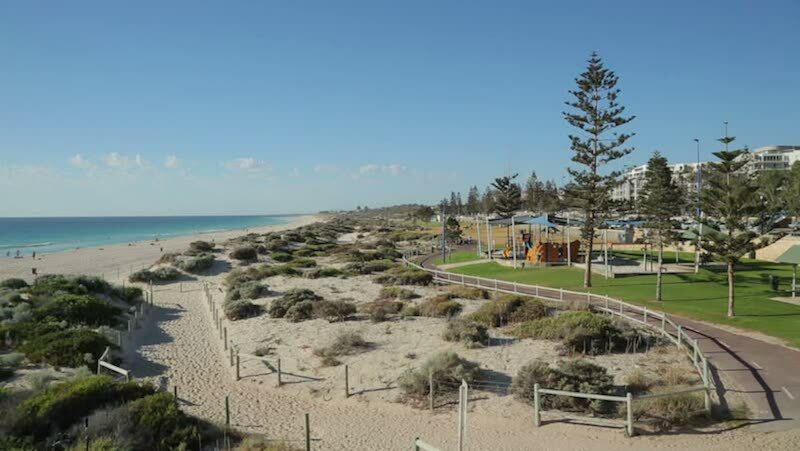 This beach is a favorite with the surfers and families alike; the Perth mainstay is just a great place to catch the rays (with over 3,000 hours of sunshine per year!). 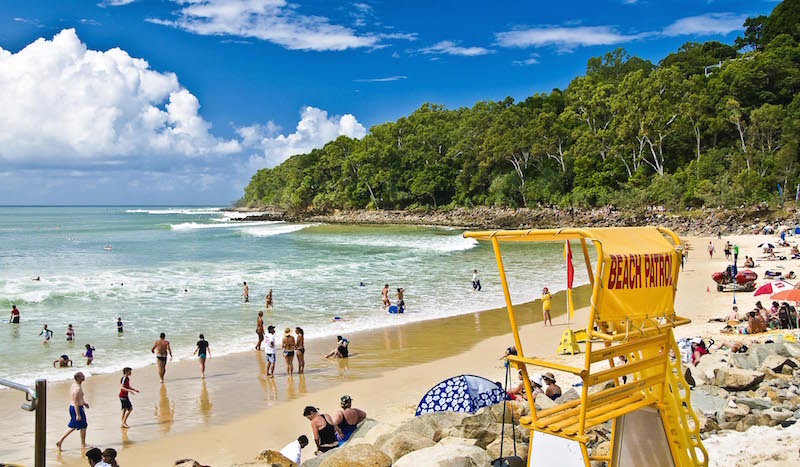 Don’t be fooled by its diminutive size compared to some of Australia’s other beaches, because the compact area certainly packs its own punch. 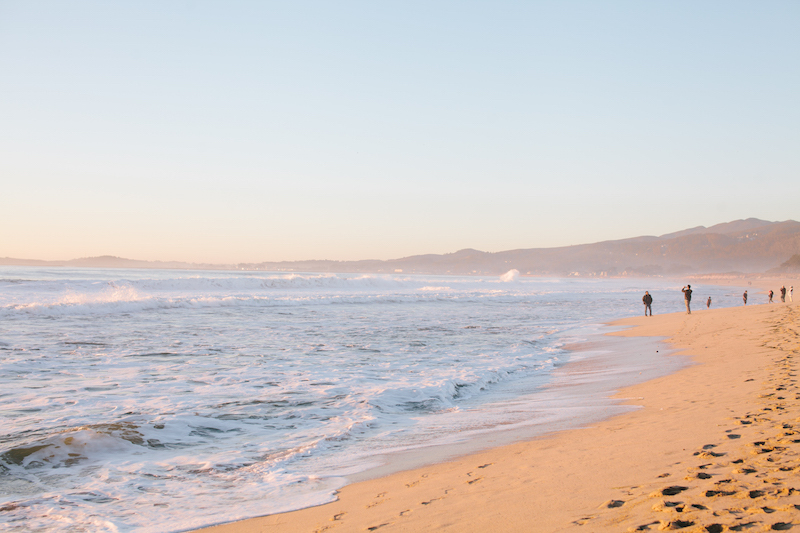 Walk along the boardwalk, or grab a seat at one of the ocean side restaurants for a little live music and a chance to grab a drink; this B&B and boutique hotel destination is perfect for that relaxation you were looking for. But if that’s not your style, no worries, there are plenty of activities always going on with the sporting clubs and private organisations in the area! Just a short stroll from City Beach, Scarborough is the older, more sophisticated cousin, which is why many travellers choose to stay in Scarborough. With a beautiful beach all its own—and a hopping night scene—this destination 15 minutes from Perth is a place for attending events in their ocean-front amphitheatre, window shopping along the shops and grabbing a spot at one of the cafes out from the sun. Definitely a place for the young (and the young at heart), this backpackers destination is full of hostels, bed and breakfasts, and luxury accommodation to fit everyone’s travel itinerary. Turquoise Bay undoubtedly gets its name from its lush, crystalline blue waters, which is exactly why this beach is among the best beaches in Western Australia. Though it’s great for swimming and sunbathing, the true jewel of the beach agenda is its proximity to Ningaloo Reef and the great snorkeling available there. Grab your gear and take part in the favorite beach to-do: snorkel drifting. If you swim out to the southern end of the beach, you can let the current take you back to north beach; it’s the perfect lazy man activity, with some seriously great views. Just be mindful not to touch the reef—protect the natural wonder for the generations to come isn’t just good manners, it’s good juju as well! When they call it Australia’s “Whitest Beach” it is in no way an indication of a somewhat tanless crowd; much to the opposite, this beach is by far one of the most beautiful beaches in Western Australia, with it’s perfect sand, blue waters, and often it’s furry clientele (don’t be surprised to see a kangaroo taking a cat nap here, they love the beautiful view too!). An even better bonus — whale watching. Between the months of July and October you can catch the majestic mammals enjoying their natural habitat off the coast of the Recherche Archipelago and in the Cape Le Grand National Park. Grab your caravan (or rent one!) and stay at one of the campsites to enjoy the picnic areas, walking trails, and moonlight walks at night. An Australian original, Shell Beach is one of only two beaches on Earth made of shells instead of traditional sand, and even more impressive, shells only from marine mollusks. Part of the Shark Bay World Heritage Area, it’s popular not just with the beachcombers and collectors, but also for swimming and taking in some good old sunbathing. When travelling to WA, you simply can not miss this spot. This is not only one of the best beaches in Western Australia, it is also the most unique one. And if you think this is just a skin deep phenomenon, you better think again — shells on this 100 kilometre beachfront can go anywhere from 7 metres to 10 metres deep! 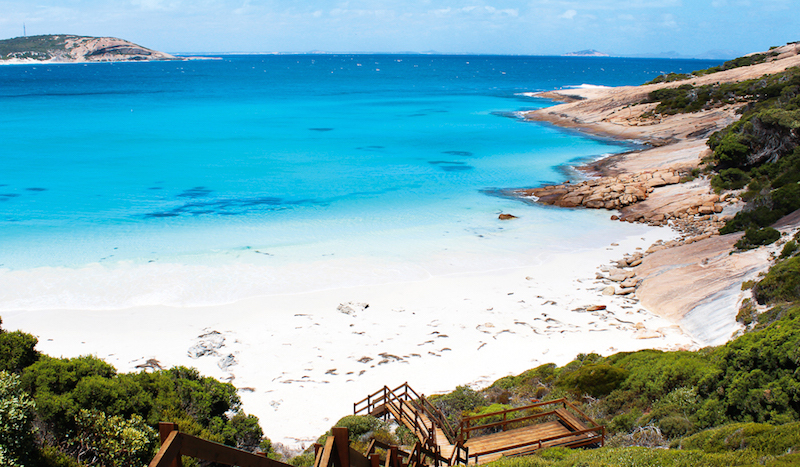 Next spot on our list of the best beaches in Western Australia is Greens Pool. While the name may be misleading, Greens Pool is in fact a bustling beachfront with a beautiful bay scene that just doesn’t quit. Spend the day exploring the rock pools, be it diving for treasures or just admiring from above with a good snorkel, these crystal clear waters are perfect for catching a look at life under the waves. Plus, avid photographers can rest easy, or get busy; the huge boulders of Elephant Rocks make for some pretty killer scenery and the astounding walks along the coast to Madfish Bay, and Waterfall Beach will definitely reward you with some spectacular panoramas. The beauty of Eighty Mile is in its serenity, and definitely in its solitude. Like the rest of best beaches in Western Australia, Eighty Mile has gorgeous white sand and azure colored waters, but this one isn’t overrun with hipsters, surfers, and the bikini-crew; instead it pulls a more nature conscious crew. 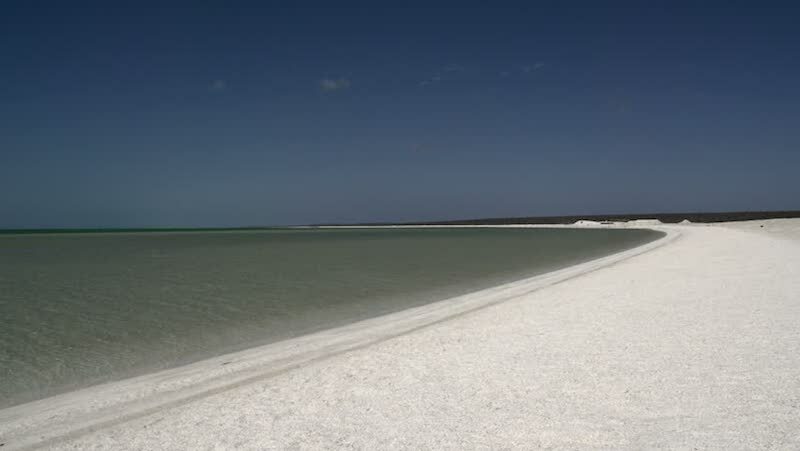 Perfect for serious fishing and bird watching—over half a million migratory birds land here during the season—head to this beach just 3.5 hours from Broome if you’re interested in a little bit of a different scene. Can you think of anything more exotic (or more glamourous) than taking in the sunset over the Indian Ocean while riding a camel? 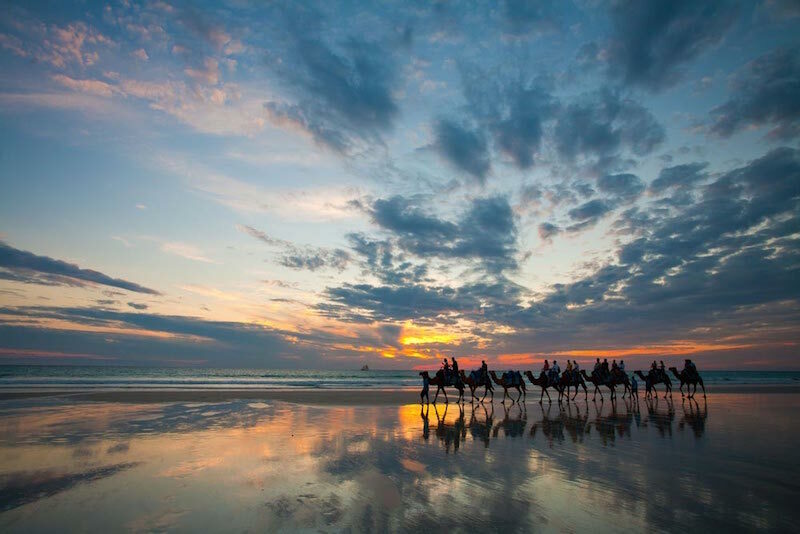 Undoubtedly, Cable Beach’s biggest draw is this fun activity, and it’s certainly one you don’t want to miss if you’re into amazing photo ops, whether of you or spectacular views over the water. While it’s not immediately close to Perth, there are daily direct flights to Broome, the beach’s hometown, and plenty of great beach resorts to hang out at for the weekend, so don’t let the distance dissuade you. It’s definitely one of the best beaches in Western Australia and is worth the travel! Whilst swimming at the Western Australia’s beaches in is generally very safe, there are some things you should know, particularly if you have not visited these beaches before. Rips and strong currents can develop, and the following tips will help to make your trip to the best beaches in Western Australia a fun and safe one. Read all warning signs which have been placed at the beach you are visiting. These signs may contain special warnings or current conditions regarding the surf. Swim between the red and yellow flags, these are there to indicate the area with the safest swimming conditions. If you are not a good swimmer or you are unsure of the surf conditions ask a lifesaver for advice, they are there to help keep you safe. Swim with a friend or near other swimmers, that way if you do get into trouble you will easily be noticed. 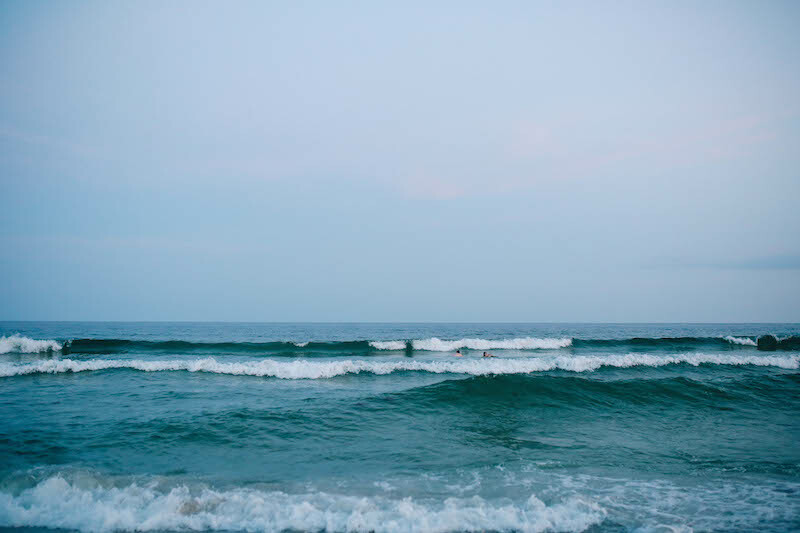 If you do find yourself caught in a strong current or a rip, do not try to swim against it, instead save your energy. If you are caught in a current or having difficulty in the water, stay calm and raise your arm in the air for help. The lifesavers who patrol the beaches are watching the water and this will gain their attention. Western Australia’s sunshine attracts many visitors, and you may be tempted to soak up all that wonderful sunshine and get the perfect tan as quickly as possible. But many international visitors, particularly those who are not used to a bright sunny climate, can underestimate the time it takes to overdo it and burn. Simply looking at your skin will not give you an indication of whether you are getting sunburnt, as sunburn can take hours or even longer to fully develop after you have come out of the sun. To avoid letting a bad case of sunburn spoil your WA holiday, follow these simple tips, particularly when spending any length of time at the beach. Use a sunscreen which blocks both UVA and UVB rays, and if possible, apply sunscreen 15 minutes before sun exposure. Re-apply sunscreen every few hours, and also after toweling off or swimming as this will remove some of the sunscreen, even if it is a water resistant product. Take a t-shirt to the beach with you so that you can slip it over the top of your bathers. A loose fitting shirt made from cotton or poly/cotton is the most comfortable choice, and anything with a tight weave will offer better sun protection. Darker coloured clothing will also block out more sun than light coloured clothes. Wear a wide-brimmed hat to limit the sun exposure to your face, neck and ears. A wide brimmed hat is a much better choice than a cap as it will cast a shadow around your face and protect the side of your neck and ears from sunburn. Wear sunglasses when outside on sunny days. The Perth sunshine can be very bright, and sunglasses will reduce the glare and stop you from squinting. If you are going to be outside all day, especially in the summer months, try to find some shade cover, particularly during the middle of the day when the sun is at it’s strongest, so that you are not out in the full sun all day long. Finally, if you do overdo things and get sun burnt, there are treatments available from the nearest chemist or pharmacy which will help reduce the pain and burning that sunburn can cause. Sunset at Scarborough, sunrise at Cable Beach? It’s possible! When travelling to WA, for many people visiting the best beaches in Western Australia immediately goes on their bucket list. No wonder, Australia’s unique nature, crystal blue water and pale sand beaches attract millions of people. Choosing where to go first and planning are tough, but so worth it!